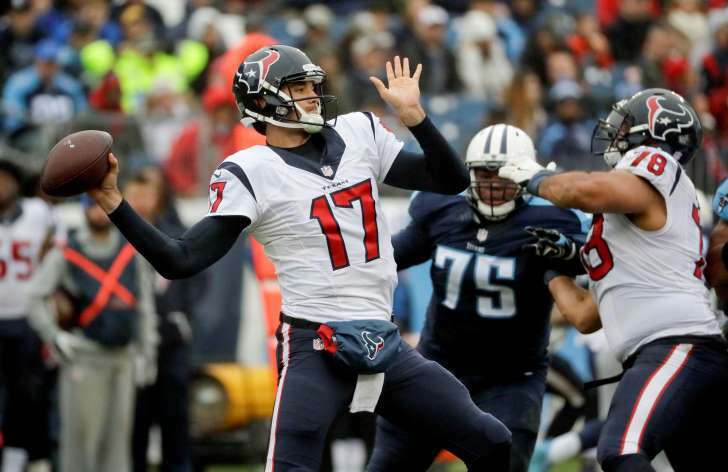 © The Associated Press Houston Texans quarterback Brock Osweiler (17) passes as guard Oday Aboushi (78) blocks Tennessee Titans nose tackle Antwaun Woods (75) in the first half of an NFL football game Sunday, Jan. 1, 2017, in Nashville. HOUSTON — Brock Osweiler will start at quarterback for the Houston Texans on Saturday in their wild-card game against the Oakland Raiders. Coach Bill O'Brien announced the decision on Tuesday with Tom Savage, who had started the past two games, still recovering from a concussion he suffered on Sunday. Osweiler started the first 14 games this season before being benched on Dec. 18 against Jacksonville after throwing interceptions on consecutive drives in the second quarter. But Osweiler got another chance after Savage got a concussion early in the second quarter of a loss to Tennessee on Sunday . Osweiler had struggled with inconsistency and turnovers before being benched, but was better on Sunday when he threw for 253 yards and a touchdown and ran for another score. "I thought Brock did some really good things on Sunday with his teammates and almost brought us all the way back," O'Brien said. "Did a nice job and we have a lot of confidence in him that he's going to go out there and play well on Saturday." Veteran left tackle Duane Brown was also impressed with Osweiler's work on Sunday. "I thought he played loose," Brown said. "I thought he communicated well recognizing the front, getting us into the right plays, made some good throws. Had the touchdown run there, so I thought he played tough." Savage remains in the concussion protocol and O'Brien said if he is cleared he will be the backup on Saturday. If not, Brandon Weeden, who hasn't played since last season, will back up Osweiler. This game will be an opportunity for Osweiler to redeem himself after failing to live up to expectations in his first season in Houston after signing a $72 million contract in the offseason. O'Brien thinks Osweiler benefited from taking a step back to observe things after he was benched and said he played more "freely" than he had in the past on Sunday. "I'm sure that in some ways it's painful to go through that, but in some ways the backup position may have helped him," he said. Osweiler has thrown for 2,957 yards with 15 touchdowns and 16 interceptions this season. This will be his first postseason start after he was benched in favor of Peyton Manning before the playoffs last season with the Denver Broncos. Savage played well when he took over for Osweiler against Jacksonville, throwing for 260 yards to help Houston rally for the win. But he failed to move the offense consistently last week against Cincinnati and couldn't do much on Sunday before he was injured. He had just 25 yards passing. While Houston has decided on its starter, the Raiders are still dealing with questions at quarterback after Matt McGloin left with a shoulder injury in his first start since Derek Carr broke his leg the previous week. Rookie Connor Cook took over and could have to make his first NFL start on Saturday if McGloin can't go. This will be the second time the Texans have played the Raiders this season after Oakland got a 27-20 win in Mexico City on Nov. 21. The Texans will need Osweiler to improve this week if they hope to win a playoff game for the first time since the 2012 season. Houston's offense has often been ineffective this season with him at the helm and the team's passing game ranks 29th in the NFL by averaging just 198.5 yards a game. O'Brien likes what he's seen from Osweiler since his benching and is eager to see what he can do on Saturday. "He's done a good job. He's been a pro," O'Brien said. "He really hasn't changed his routine at all. He's been in here studying like he's the starter. He's in here this morning getting ready ... he feels good and I think he's ready to go." Just over two weeks ago, Brock Osweiler was benched by the Texans for poor play. With his replacement, Tom Savage, recovering from a concussion, though, Houston Coach Bill O’Brien announced Tuesday that Osweiler will start his team’s playoff game Saturday against the Raiders. Osweiler came on in relief of Savage in last week’s season finale against the Titans and acquitted himself reasonably well, completing 21 of 40 passes for 253 yards and one touchdown with zero interceptions, adding a one-yard TD run in a 24-17 loss. For the season, Osweiler completed 59 percent of his passes for 2,957 yards, 15 touchdowns and 16 interceptions. His rating of 72.2 was second worst in the NFL among qualified quarterbacks (the Jets’ Ryan Fitzpatrick finished at 69.6). Savage is in the NFL’s concussion protocol, and there is a chance he could be cleared by Saturday’s game. However, O’Brien said that if Savage is cleared, he will be Osweiler’s backup against Oakland; if not, Brandon Weeden will be the No. 2 quarterback. Savage, a third-year player, took over from Osweiler in a Dec. 18 game against the Jaguars after the latter, who had been struggling for most of the season, got off to a poor start. The following week, Savage played the entirety of a 12-10 win over the Bengals but was not particularly effective, completing 18 of 29 passes for 176 yards, with no touchdowns or interceptions. In the offseason, Osweiler was lured to the Texans from the Broncos with a huge contract, a four-year, $72 million deal with $37 million in guarantees. Having played his way to the bench, the fifth-year player, who got his first NFL starts last season, now will have a chance to show that he was not a major free agency bust. O’Brien claimed Tuesday that he thought Osweiler benefited from his recent stint out of the starting lineup. The Raiders also come into Saturday’s game with issues at quarterback, as Matt McGloin, who had been filling in for an injured Derek Carr, hurt his shoulder in a game against the Broncos last week. Rookie Connor Cook replaced McGloin and saw the first action of his NFL career in Sunday’s loss; he is expected to start against the Texans. Houston Texans head coach Bill O'Brien announced Tuesday that quarterback Brock Osweiler will start the team's playoff game against the Oakland Raiders on Saturday, even if Tom Savage is available. The Texans relayed O'Brien's decision on their official Twitter feed. Mark Berman of KRIV noted the coach stated Savage will be the backup should he make it through the concussion protocol before the game. Osweiler struggled mightily during the regular season. The former Denver Broncos reserve tossed more interceptions (16) than touchdowns (15) and averaged just 5.8 yards per attempt en route to a 72.2 passer rating, which ranked 29th out of 30 qualifiers. The lackluster production was compounded by the fact the Texans gave him a four-year, $72 million contract in the offseason, per Spotrac. The deal included $37 million in guaranteed money and would carry $25 million in dead cap space for 2017. O'Brien benched the 26-year-old in Week 15, but the Texans don't have much choice but to give him another chance in the postseason. Savage suffered a concussion on a quarterback sneak during the team's Week 17 loss to the Tennessee Titans. He's in a race against time to make himself available for Saturday's game, and it would have been tough to count on him as the starter under those circumstances. Brian T. Smith of the Houston Chronicle noted O'Brien stood by the play call Tuesday. "It's football. Injuries occur," the coach said. "I'm not regretful of that play call at all. You're out there to play." Regardless, it's not like Savage had been putting up big numbers since taking over the job, throwing no touchdowns in 73 attempts across three games. Brandon Weeden, the Texans' No. 3 option, enjoyed some success with the team last year in limited duty (three TDs and no INTs), but he hasn't played all season. His career 76.0 passer rating doesn't suggest he'd be a miracle cure for Houston's lackluster offense. So it's back to Osweiler. He completed 21 of 40 throws for 253 yards with one touchdown and no picks in relief of Savage last week. Drew Dougherty of Texans TV noted the quarterback stated afterward there wasn't any change in his weekly approach after getting benched. "When you're the backup quarterback, your job is to prepare like the starter and be ready to play at all times," Osweiler said. The silver lining for Houston is the fact Oakland is in a similar spot. The Raiders are waiting on further word about the availability of backup quarterback Matt McGloin as he tries to recover from a shoulder injury. If he cannot go, the team will turn to rookie Connor Cook to fill the void left by Derek Carr. Based on those quarterback situations, expect a defensive battle Saturday afternoon as the teams fight for a place in the AFC's divisional round. 0 Response to "Osweiler to start for Texans against Raiders"